Thanks to some inquiries sent to the Darton, Longman and Todd Ltd from frequent commentator and guest blogger Chris Buckley, I am happy to publish the responses from the editorial director at DLT David Moloney concerning the RNJB. 1) Is this a new translation, or an "in house" editorial revision of the NJB (similar to the RSV-2CE from Ignatius Press)? 2) If it's a new translation, who is the translation team? 3) Is the the École biblique involved in these revisions at all? If so, is it based on its "Bible in its Traditions" text? 4) Will it carry an imprimatur? 1) The RNJB is essentially a new translation, in that Fr Henry has returned to the original scriptures throughout (rather than just updating the NJB). In many cases he has made the same translation choices as he did for the NJB, so sections of the text have remained the same, but overall the extent of the differences between RNJB and NJB is substantial enough to call it a new translation. The Study Notes have been completely replaced (with notes written by Fr Henry but only previously seen in the CTS Catholic Bible), bringing the scholarly content up to date. The Psalms for the RNJB, as you will have seen, now comprise Fr Henry’s slight adaptation of the 2010 Revised Grail Psalter. 2) Fr Henry is the principal translator, as he was for the NJB. He has consulted widely throughout this process – notably with Professor Francis J Moloney SDB (no relation!) on the New Testament, and Andrew Carter of Ampleforth College on the Old Testament. 3) Fr Henry has liaised with L’École Biblique throughout the process but they have not been directly involved in the translation. 4) The Old Testament has not yet been completely finalised but we have arranged with the Bishop’s Conference and the Department for Life and Worship to submit the full Bible for review for the imprimatur as soon as it is ready. Your Chance to Ask Fr. Henry Wansbrough a Question. In the past, we were blessed that people like Mary Sperry of the USCCB graciously responded to questions from you regarding the NABRE. Now, we have a chance to ask Fr. Henry Wansbrough OSB, editor of the RNJB (and NJB), some questions concerning the new translation. David Moloney of DLT offered to share some questions with Fr. Henry. He said, "I would encourage you and other members of the blog forum to put together some questions that you would like to ask Fr Henry. It could prove a further opportunity for him to explain the reasoning behind the new translation, and the approach he has taken. I can ask him if he would be willing to answer a selection of questions if you think that would be helpful and of interest." 1) Submit your questions in the comment section of this post. Chris and I will review all the questions and select the ones that will be submitted to Fr. Henry for consideration. Again, I'd like to thank Chris for taking the initiative in contacting DLT and making this a possibility. What original language texts did you base the RNJB translation on? Did you use standard critical editions such as the Nestle-Aland 27 and the Biblia Hebraica Stuttgartensia? Why did you decide to prefer a formal equivalence style of translation over the more dynamic equivalence style of the original Jerusalem Bible and the New Jerusalem Bible? Does the RNJB Old Testament more closely follow the Masoretic text than the Jerusalem and New Jerusalem Bible? I greatly appreciate the depth and quality of the notes given in the standard editions of the NJB for serious study of the Scriptures. While the new notes written by Fr Wansbrough are what a casual reader could reasonably manage, for serious students of the Bible, something deeper would be needed. Are there plans further down in the pipeline to release a RNJB with the updated notes from the French La Bible de Jerusalem? If this is essentially a whole new translation then why use “Jerusalem bible” in the title? Why not just give it a completely new translation name? -The NJB came about after the 1973 revision of the French JB. The French was revised again in 1998 but never addressed in a corresponding English revision. Does that edition serve as a reference for the RNJB now? If so how? -What is the connection of the RNJB with the Ecole Biblique's "Bible in its Traditions" text (if any)? What is the roel of the Ecole with the Jerusalem Bible tradition, at this point? Is the RNJB still a product of the Ecole, or have the two gone their own ways now? -You position the RNJB as a Bible for proclamation. Does that mean you adhere to the Nova Vulgata, per Liturgiam authenticum? If so, how and where does that affect the text away from the witness of the original languages. -Are discussions underway to revise the British lectionary around this translation? If so, how does Magnum Principiam change the process for approval? Did it allow you any greater freedom in your chosen rendering (vis a vis the preference for the Nova Vulgata mentioned above)? -Will the Old Testament continue to spell out the Divine Name, or follow the tradition of LORD? I would simply like to thank Fr. Henry for all his wonderful work over the years. 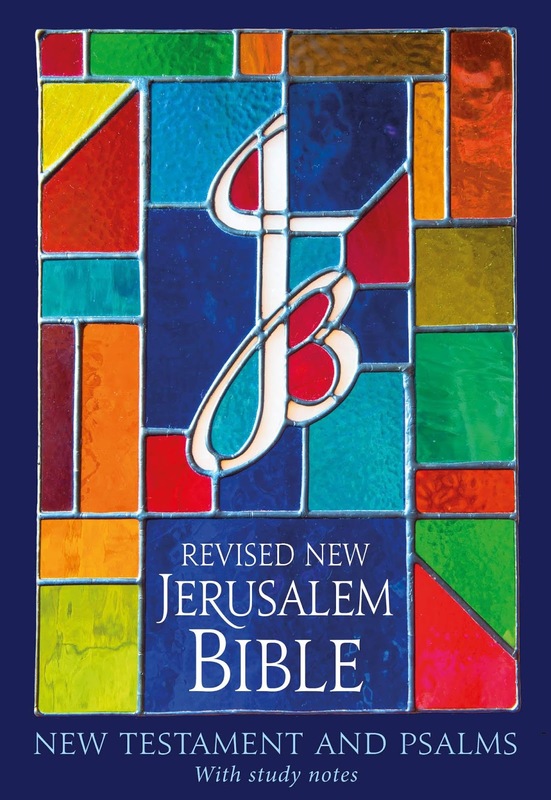 I've always loved the NJB, and I’m very much looking forward to the entire RNJB Bible. Thank you, Fr. Henry. Keith.. may I ask.. if you love the NJB what is it that you are looking forward to in the RNJB? Could you comment on the differences between translating by committee, versus working as an individual translator? What advantages or disadvantages might the RNJB enjoy over committee-based translations? I mentioned in an earlier post that I appreciate translations like NEB/REB, JB/NJB, and Knox for the unique/poetic English. I'm an English teacher and some of my favorite authors are Shakespeare, Melville, and Poe. Years ago, I was looking at an OT passage (don't remember which one) and compared the NJB and the NRSV. The NRSV had something like the exact measurement of flour or bread, while the NJB had "oven full" of bread. I thought that was much more evocative. I like unique turns of phrases like that, even though they may not be "exact" translations. That's what I like about the NJB. It's not the notes; I'm not a huge fan of study Bibles. So, I'm hoping the RNJB retains some of that poetry and unique English, even though it's purported to be less of a dynamic translation than its predecessor. If lectionary use was in mind during the revision process for the RNJB, were you able to consult with any representatives from the bishops' conference concerning the types of translation choices that would be needed to gain final approval? In the same vain, did you have any formal or informal access to information concerning the attempts of adapting the nrsv or the esv by the ICPELL? I realize that the translation was completed before Magnum principium was issued, but did the potential for more flexibilty from Rome influence any choices made? Dear Father Henry, Please consider taking a very close and careful look at (1) Genesis 14:13, wherein the NJB Aner is said to be "the Hebrew" instead of Abram, and (2) Isaiah 26:3, which seems so far at variance with most other translations ("This is the plan decreed: you will guarantee peace, the peace entrusted to you."). Thank you. 1. Will there ever be a digital edition of the RNJB? 2. Will the publishers (DLT and Crown division of Penguin) ever allow the work to be published online on a site such as Bible Gateway? 3. Will the RNJB ever be published in a high quality leather (such as calfskin) either in the UK or in the USA? I do see an RNJB ebook pre-listed on the Google Play store for Android. What additional features and helps will this edition include? here are some examples: tables and notes as found in the CTS Bible, Historical framework (Chronological table), Table for Mass readings (lectionary calendar), New Maps, Glossary, Subject (Topical) Index, Catholic Apologetic Bible verses, Key Scriptural Passages etc.